Welcome to Google CS First Sports, my name is Joe. Over the next eight club activities you will create some sweet, interesting sports projects using computer science. In this activity, you'll learn what computer science is, see the connection it has to various sports and finally you're going to make your own program, a victory celebration. CS Fist Sports is a computer science club. Computer science is using computers to make amazing projects. Programs created with computer science help people play, solve problems and do work. You'll learn different ways computer science relates to the things you do and see everyday, including sports. The many ways computer science effects your daily life will surprise you. Computer science makes it possible to do anything from improving your sports game with digital data collection to developing the next generation of healthcare technologies that can help others. Over the next eight club sessions, you'll discover some incredible creations people build and problems people solve using computer science, like these, sports accessories, modular cell phones, magnetic block-based circuits, autonomous robots, fitness trackers for sports teams, awesome cameras and really cool camera algorithms. There's so much more, let's check it out. Take a look at these projects that you'll get to build over the next eight club sessions. Click the next arrow below this page to move on to the next video. 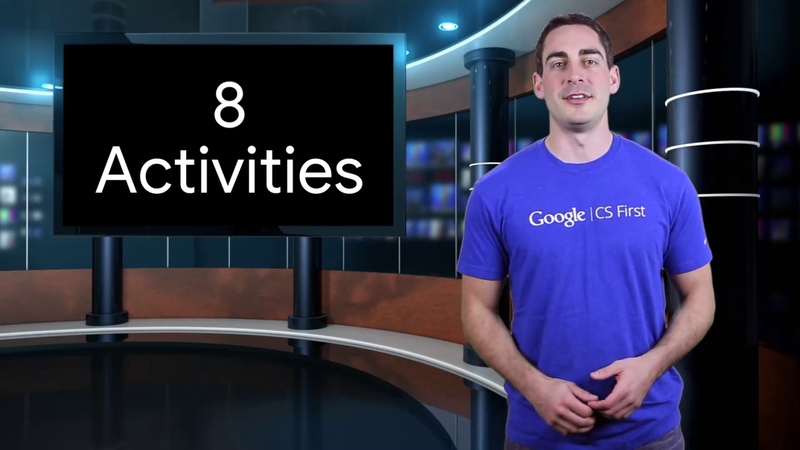 Are you ready to take your game to the next level with Google CS First Sports? I know I am, let's go. Click the CS-First.com tab and the green "Next" arrow to watch the next video.